Ecuador features many different geographies from snow capped volcanoes, jungles to coastal plains and is a fantastic place for growing many types of fruit. Fruit lovers will discover, along with all the common tropical fruits, many new varieties of fruit not imported or found in North American stores. Ecuador is the largest exporter of maracuya (passion fruit) concentrate in the world and of course the world's largest exporter of bananas. Naranjilla or little orange – Naranjilla's are a bright orange fruit which is a bit smaller than a tennis ball. The inside of an naranjilla is full of pulp with tiny seeds when strained and sweetened can make a orange-greenish juice that is tangy and leaves an aftertaste that is almost perfumey. The naranjilla is native to Ecuador and Columbia and is rarely grown anywhere else. 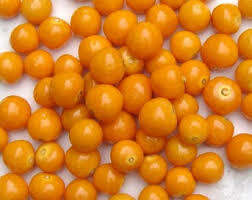 Uvilla or husk tomato, ground cherry, gooseberry – This small yellow fruit is called ground cherries as they grow close to the ground and are cherry like in both shape and size. The uvilla has nothing else in common with cherries as there is no stone or they do not even taste like cherries. The uvilla is bright yellow and grows inside a husk that is shaped like a small thin lantern. The flavours of the uvilla are something like a pineapple and are eaten raw. 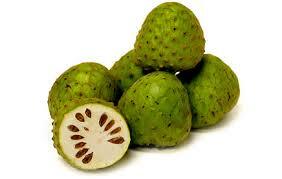 Chirimoya or Custard Apple – The cherimoya is related to the guanabana/soursop. A cherimoya has a tasty white pulp that is in a green mottled skin and can be the size of a small melon. The white pulpy flesh is full of black seeds which are large and smooth and can be removed easily. Tomate de Arbol or Tree Tomato – The tree tomato is red and shaped like an egg and is full of seeds that are covered by the pulp of this fruit. It is a bit like the passion fruit. 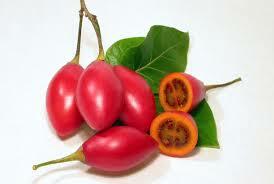 The tree tomato fruit is good for juice and can be used in a dessert if boiled in sugar. This fruit if eaten fresh can be very sour. 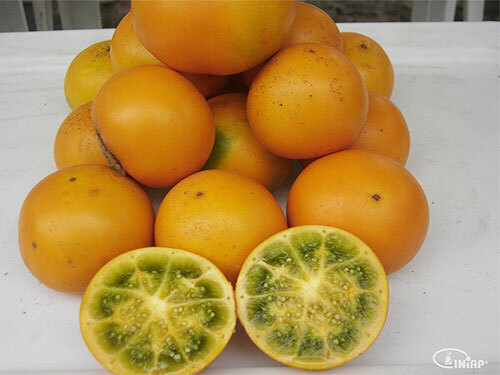 Maracuya or passion fruit – The maracuya fruit is shaped like an egg and yellow. The fruit is hollow and filled with dozens of seeds inside which are covered with the pulp. The maracuya can be eaten fresh off the vine and has a tart flavour. The people in Ecuador put the pulp with the seeds in a blender for a few seconds to make juice and add a bit of sugar (brown sugar is nicer) to sweeten the juice. Orito or Finger Bananas – Many different types of bananas are grown in Ecuador but the Orito banana is the smallest banana and has a much sweeter and richer taste than the other bananas. 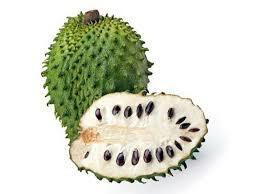 Guanabana or soursop – The guanabana's outer skin is rough and green. The guanabanas are large and can even reach the size of a volleyball. The inside of this fruit is white with pulp, and is full of many cherry like seeds. The flesh inside the guanabana can be eaten fresh, has the taste of a strawberry and is mild and quite sweet. The Ecuadorian people make this fruit into juice, as they can be very messy to eat. 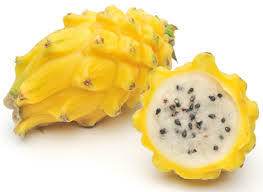 Pitahaya or Dragon Fruit – The pitahaya fruit grows on a type of tree cactus and is a yellow bumpy fruit. The fruit is cut opened and the flesh is a bit transparent and gray in colour and is full of small black seeds. The pitahaya is a bit like a kiwi. The pitahaya can be eaten the same way as a kiwi but can also be made into a juice. 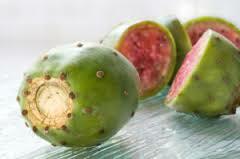 The pitahaya is said to have mild laxative properties. 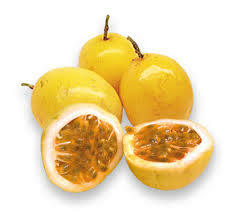 Taxo or Banana Passion Fruit – The taxo is a long soft fruit that looks like a small orange banana but straight. The fruit has many seeds that are covered with pulp which when separated can be made into ice cream or juice. 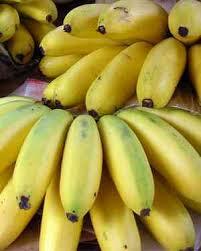 This fruit has a tart taste and is tangy and is not usually eaten fresh. Tuna or Prickly Pear – This fruit should not be confused with the fish – in Spanish you would ask for "atun". The tuna fruit is from a species of cactus and grows all around South America. Looking at the tuna fruit is does look like a small cactus, the outer skin of this fruit is green and when opened there is red pulp inside the fruit. 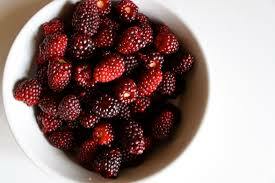 There are small seeds in the fruit that are crunchy, they can be eaten and are tasteless. This fruit has a very mild flavour that is fruity, although bland when compared to other fruits from Ecuador. 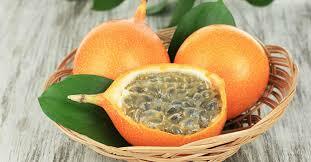 Granadilla or Sweet Granadila - The granadilla fruit is small, a pale pinkish-orange colour and shaped like an egg. The fruit inside has dozens of black seeds which are enclosed in a gray pulp that is semi transparent. The pulp and seeds can be eaten whole without the skin. Granadillas have a fruity flavour and are very mild. They are a popular fruit here in Ecuador. This fruit is too mild for making juice and is usually eaten fresh. Mora or Blackberry – Blackberries from Ecuador are larger than the blackberries that we would see in North America and are grown all year round. In most parts of the country blackberry bushes grow like weeds. Although the blackberries can be eaten fresh, the Ecuadorian people blend them with water and some sugar and make a very tasty juice. Babaco – or Mountain Papaya - The babaco fruit is seedless and has a smooth skin that can be eaten and is said to taste like strawberry, papaya, kiwi and pineapple. The fruit is pentagonal in shape. 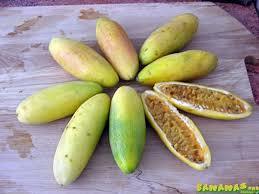 The babaco like the papaya, is grown for its edible fruit and for its fruit juice. The babaco fruit has no seeds present in the fruit. At this point the fruits reach a length of about 12 inches long and 8 inches wide. They are distinctly five-sided, rounded at the stem end and pointed at the apex. The flesh of the babaco is very juicy, slightly acidic and low in sugar. 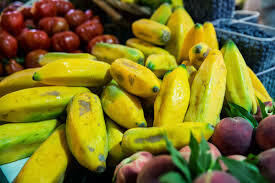 The Ecuadorians not only use this fruit for juice but also to make a dessert called Dulce de Babaco and it can also be used as a pie filling and goes great with apples or strawberries in a pie. Pepino or pepino dulce (melon shrub, tree melon, sweet cucumber and pear melon) - Pepino is an exotic fruit that has a taste that is like a cucumber, cantaloupe, and a honeydew melon. The pepino has a smooth round or oval shape and its colourful skin is light yellow with purple lines. The fruit of the pepino is an orange/yellow colour with juicy flesh. There are also seeds which can be eaten. The pepino is commonly used as a dessert fruit, and combined with other exotic fruits in fruit salads and platters. The pepino can also be eaten raw, provided that the outer skin is removed. Maruthi fruits are one of the largest papaya pulp exporters from India. Papaya Pulp is extracted by commercial processing of properly Matured, Sound, Cleaned and Ripened Papaya.